Culann Patera, one of the most colorful volcanic centers on Io, is the centerpiece of this mosaic of the best high-resolution, color view of Io yet returned by NASA's Galileo spacecraft. The picture was constructed from images taken through the red, green, and violet filters of Galileo camera and has been processed to enhance the color variations. The resolution is about 200 meters (or yards) per picture element, and north is to the top. The color mosaic shows the complex relationships between the diffuse red deposit, the more confined green deposit, and the various colored lava flows. 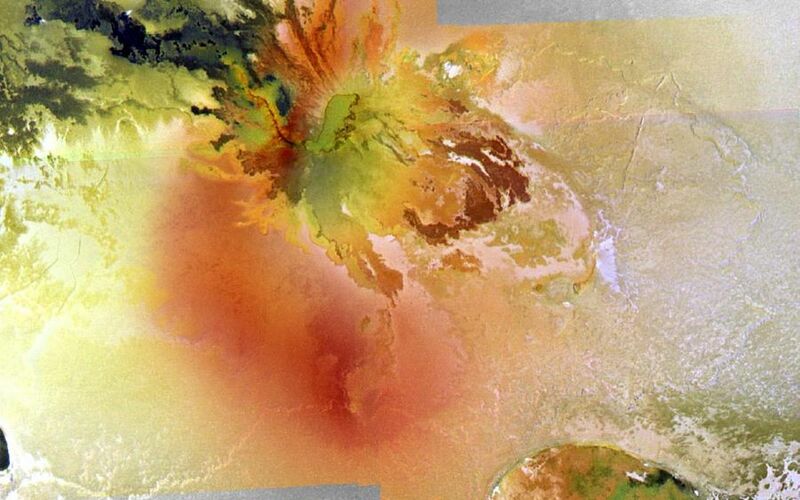 Culanns central caldera (above and to the right of center) has a highly irregular, scalloped margin and a green-colored floor. Lava flows spill out of the caldera on all sides. A dark red, curving line extending northwest from the southwestern tip of the caldera may mark a crusted-over lava tube feeding the dark (and hot) silicate flows to the northwest. Unusual dark red flows to the southeast of the caldera may be sulfur flows or silicate flows whose surfaces have been modified. 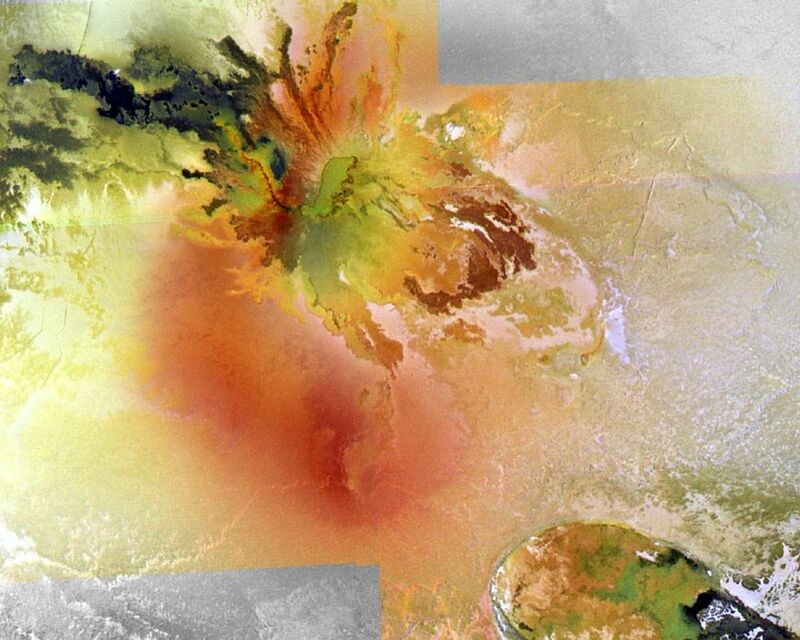 The diffuse red material around the caldera is believed to be a compound of sulfur deposited from a plume of gas. Culanns caldera and several lava flows extending from the caldera are coated by greenish materials. Green material can also be seen in the caldera to the lower right of the image, named Tohil Patera. The greenish material often has sharp boundaries, so it is apparently confined to the caldera floor and the dark flows. Galileo scientists are investigating whether the greenish material forms as a coating of sulfur-rich material on warm silicate lavas. The images were taken on November 25, 1999 during Galileo's 25th orbit at a distance of 20,000 kilometers (12,500 miles) from Io. The Jet Propulsion Laboratory, Pasadena, CA manages the mission for NASA's Office of Space Science, Washington, DC. JPL is a division of the California Institute of Technology, Pasadena, CA.